When you started coxing, did you know what it would bring to you? Finding the real reason you get up so early, or layer on so many jackets for a cold-weather practice, or walk that fine line between being an athlete and being a… well, being something else when your boat needs it–that balancing act of leadership–is what this issue is all about. There probably isn’t just one reason you’re a coxswain. There are probably many skills you’re working to develop and there’s probably more than one reason you’re good. 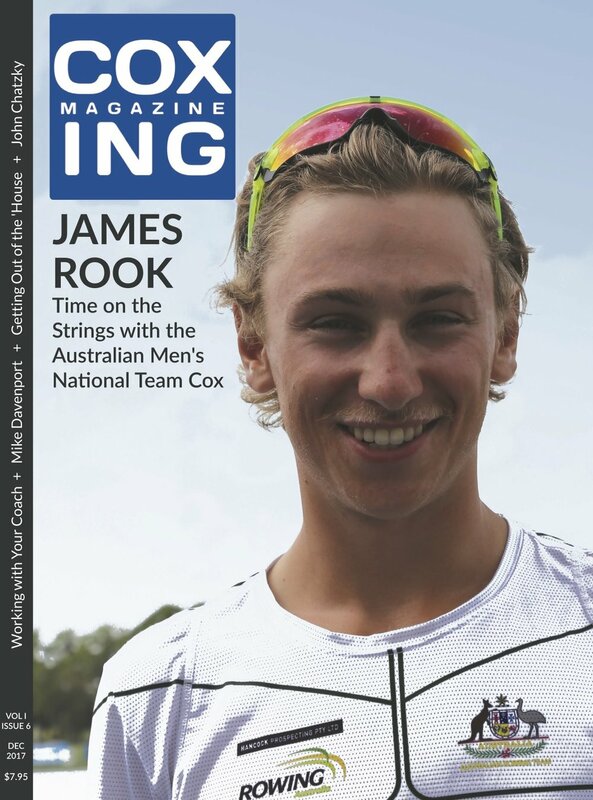 In this issue, we hear from James Woods about his thoughts on making the Australian men’s national team, and how coxing the smallest boat–the coxed pair–made him a better coxswain in the big boats. He is straightforward about his approach to coxing, and, he says, his biggest asset is that he’s moldable. Mike Davenport is the author of the book that is known as the authority on rigging a boat for speed, The Nuts and Bolts Guide to Rigging. He steps us through what tools he carries in a boat, what he thinks coxswains should know about rigging, and what they shouldn’t. Daniel Gilbert is back as a contributor in this issue, detailing an incident with a referee that helped to make him a great coxswain. Even though the incident was self-inflicted, he was big enough to see how important the lesson was. Barb Grudt, a two-time world champion and experienced coach, explains her tactics for helping coxswains develop their skills–in the erg room and on the water. As a rower and a coach, she knows that the external motivation coxswains try to give their rowers sometimes isn’t what they need the most. How do you know what to say to help a rower improve their form? Work with your coach. But more than all of that, there is that question that keeps coming up, the one that keeps many of us awake after we know we need to be asleep because the alarm is going to go off in just a few hours. The constant question in the boat: When to speak and when to listen? For coxswains, this may be the defining element of style–and effectiveness. The answer is as important as the question.